The silicone roof coating system from Mule-Hide Products Co. Inc. extends the life of aging roofs, ensuring that they continue delivering watertight, energy efficient performance while significantly delaying the day when tear-offs — with the associated cost, landfill waste and disruption to building occupants — are needed. • Si cleaning solvent to wash tools and equipment. Silicone’s low water absorption provides superior resistance to ponding water. The Silicone roof coating system outperforms both conventional solvent and solvent-free protective roof coatings. 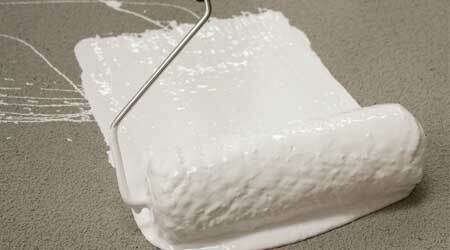 A quick cure time makes same-day re-coating possible, helping complete jobs fast. All products are solvent-free and comply with volatile organic compound (VOC) regulations throughout North America. White top coats meet Cool Roof Rating Council (CRRC) cool roof requirements, helping building owners reduce energy consumption and costs by reflecting solar energy, reducing temperatures inside the building and improving the efficiency of rooftop air-conditioning units. The fully adhered system protects the roofing system from damage caused by ultraviolet radiation, reduces thermal shock and seals water entry points.